An Indian doctor arrested the same day his brother allegedly drove a Jeep Cherokee loaded with gas bombs into Glasgow's main airport was charged Saturday with a terrorism offense. A distant cousin in Australia was also charged in the failed attacks in London and Glasgow. It was not immediately clear whether the SIM card was used in the foiled attacks. Australian Magistrate Jacqui Payne adjourned her decision on whether to grant Haneef bail until Monday. Prosecutors have opposed bail for Haneef, saying he could flee the country if released. Porritt said Haneef made a "flurry" of phone calls to India on the day of his intended departure, including one to his brother who informed him police had linked him to the bomb plot. But Haneef says he was rushing back to India to see his wife and newborn daughter, born June 26, and that he planned to purchase his return ticket in India. Keim said it would be impossible for his client to leave the country because he has surrendered his passport and his photograph has been plastered on newspapers and television reports for the past two weeks. "Whatever flight risk he represented two weeks ago, he doesn't represent now," Keim said. Prime Minister John Howard urged caution in Haneef's case, saying he was still entitled to the presumption of innocence. The case emerged June 29, when two cars packed with gas cylinders and nails were discovered in London's entertainment district. 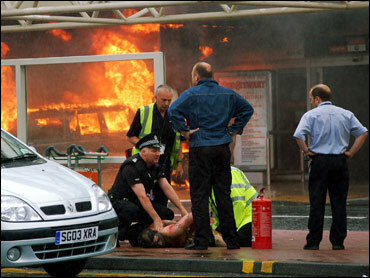 The next day, the flaming Jeep smashed into security barriers at the main terminal at Glasgow airport. Some of the eight detained worked together as colleagues at hospitals in England and Scotland, and experts and officials say the evidence points to the plot being hatched after they met in Britain, rather than overseas.